Does anybody know what the Plot function does? The user manual gives an explanation for PlotPhase, and syntax for PlotOn, PlotOff and PlotChange, but the only mention of Plot is where to the command is. 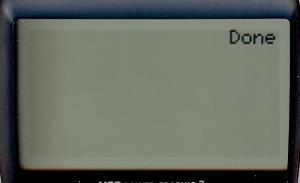 I am asking because I am trying to debug a program that makes heavy use of this command. I do not have fx-9750GII but have fx-9860GII. I think the Plot command works same, so let me tell you about Plot command with fx-9860GII. Note, you use CoordOff, not CoordOn. 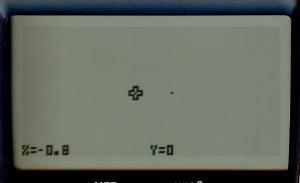 Probably you know PlotOn 1,0 draw a dot at coordinate (1, 0). So what does Plot 1,0 draw? Run the code , then you get following result. A cross hair cursor comes and brink in screen. You can move the cursor using arrow keys. When you mode the cursor, what do you see? There is no dot drawn, just the cursor is moved. 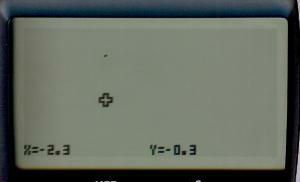 Now you know that Plot 1,0 just display cursor without drawing dot. switched to text screen and then Done is shown. graphics screen comes back with the moved cursor. Then again move the cursor, then what do you see? at this time you see dot! 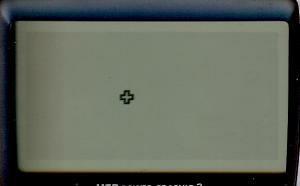 Plot 1,0 display cross hair cursor, and press EXE key, then you finally get a dot. display cursor, does not draw dot. Press EXE key after the cursor is coming then draw dot. This is most different function from PlotOn command. Repeating this, you can draw multiple dots. You will see X and Y coordinate values in the bottom line. Use Plot command with CoordOn setting, you get coordinate value displayed. This is also different function from PlotOn and now you know Plot command works differently by CoordOn/Off setting. 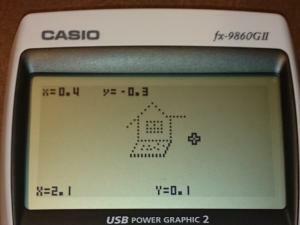 Move the cursor, then the displayed coordinate values change. Using While / WhileEnd loop, to repeat Plot 1,0 . 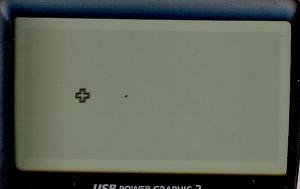 At this time, cross hair cursor does not come up, but draw a dot at (1, 0). Why the cursor does not come up? 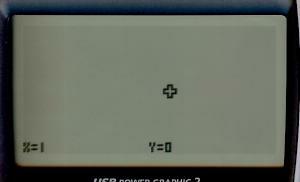 Before Casio Basic system hands over control from Plot command, the cursor is not displayed. cursor comes, then you can move the cursor as you like. Press EXE key then plot a dot. The dot is hided by cursor, but you can see the dot when the cursor is moved. As ruing the while loop, cursor comes back on (1, 0). This behavior is as code of Plot 1,0◢ , no question about this. This code shows X and Y values for further understanding how Plot command works. Edited by Krtyski, 03 December 2016 - 03:20 PM.